Reading this paragraph the other day deeply convicted me. My spiritual kryptonite is worrying about what people think about me and wrestling with discontentment when I fall short of my own expectations. I trouble myself with thoughts like, I should be more talented, more capable, more accomplished, more beautiful, more physically-fit. It certainly doesn’t help when I saturate my mind with images and ideas that permeate social media. Whether the channel is through Facebook, Instagram, or Pinterest, the effect is similar…Does my life measure up to what I see? Am I good enough? How can I compete? I suppose this is the insidious reality of being human. Everyone is susceptible to vanity. But let me speak for myself instead of attempting to drag mankind down with me to make my weakness look less ugly! What I’m trying to admit to is this: the temptation to benchmark myself against others and prove my worth is very undead in me. Therefore, I have to go back to the cure…anchoring my security in Jesus Christ and aligning my purposes to His. I have to do this regularly — to revisit what God has done for me, how much He loves me, and what His will is for my life. Otherwise, I pursue the world’s definition of success and it’s offerings for fulfillment only to find that these aren’t the things that truly satisfy. To resist the pull which distances me from God and His will, I make some practical choices. First, I meditate on God’s truth. Meditating on God’s truth involves regular Bible reading. I don’t know how many times I’ve read the Bible cover to cover and yet I still pick up valuable insights that I can apply. Second, I choose to guard what I see and hear. The apostle Paul said, “All things are permissible but not all things are profitable.” It may be easy to access media and entertainment in a day and age when everything is a click or swipe away, so I need to have self-imposed filters. I make a conscious effort to avoid overexposure to sites, movies, or tv programs that diminish my desire to follow God’s will, direct my attention towards materialism, or stir up feelings of self-centeredness. Third, I am selective about the close friendships I keep. Colin Powell was credited with saying, “It is better to be alone than in the wrong company. Tell me who your best friends are and I will tell you who you are. If you run with wolves, you will learn how to howl but if you associate with eagles you will learn how to soar to great heights.” This isn’t about avoiding every person who doesn’t share the same values as I do. Ministering to people is different than best-friending them. However, when it comes to choosing the persons who surround me as confidants, counselors and advisors, I am picky, not snobby, but wisely selective. I want to learn from people who encourage me to seek God and correct me when I’m going off-course. I am not strong enough to withstand peer pressure (good or bad) which is why I need to be with people who will hold me to a standard of righteousness and holiness, both by word and by example. Fourth, I seek out ways to grow my hunger and thirst for God. Prayer is certainly a part of this. But this is also about “setting my mind on the things above, not on the things that are on the earth.” (Colossians 3:2) Sometimes, the best way to do this is to physically remove myself from my day to day preoccupations in order to see the bigger, spiritual perspective. Who am I? Why am I here? What am I living for? There is so much untruth in the messages, visual stimuli, and experiences I encounter daily that it becomes necessary to take a pause in order to detox! If you are like me and need to get away for a weekend to recalibrate your heart and mind, consider attending the True Life retreat at Mt. Makiling Recreation Center on July 31 to August 2, 2015. I’m looking forward to much needed spiritual feeding and renewal, and the opportunity to rediscover what TRUE LIFE, TRUE LIVING is all about! What about you? (Edric will also be speaking for one of the sessions so if you could, please say a prayer for him, too!) 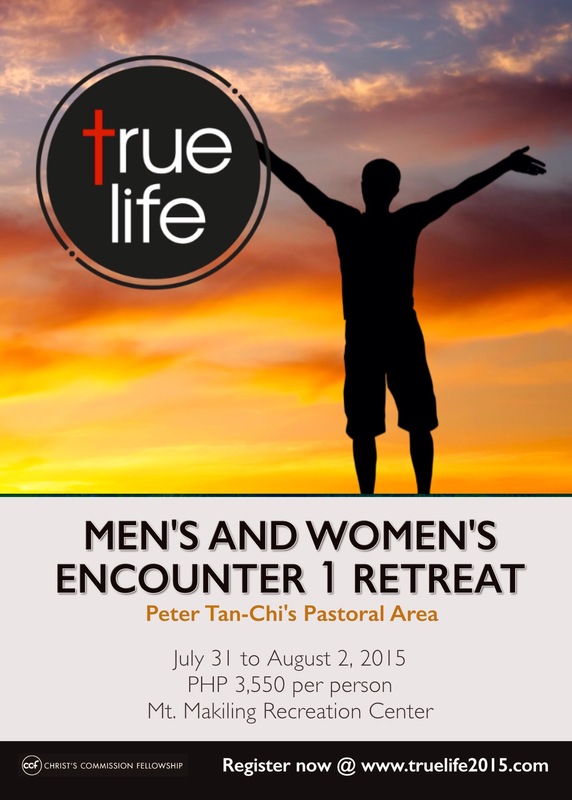 Check out True Life 2015 for more details. You see about everybody born in sin of Christian concept, we do not believe so, and the bible doesn’t teach with joy so. In the book of Luke first chapter; Elizabeth and her husband Zacharia was “SINLESS.” And Jesus speaks about Abel and he said “from RIGHTEOUS Abel to Zacharia” you kill the prophets! Who? The Jews. But did Jesus said “RIGHTEOUS?” Unless Jesus is speaking with tiniest cheek that means they are righteous. Now you’re saying everybody is a sinner. But why would you label or paint everybody with the same brush? You don’t have right to do that. And God Almighty tells us in the bible in the book of Ecclesiastas, He said, He the Lord had made mankind upright but he had sought out many inventions.. these are all your concoctions, your creations.. He didn’t make you so. If He created us as a sinner, then what right does He to expect us to stand up and walk straight? If I’m born a sinner and I’m weighted down a load stones of sins and he wants and expects me to walk straight?? He’s unjust. You load your little child and you said come up straighten up with heavy sack on his back and his forehead almost touching the ground and you said why don’t you stand up straight and walk? I say you’re unjust.. you’re a lunatic! If God do the same for us then we will describe him a lunatic. You see this idea of sin inherited this is Christianity, you talk about the original sin, the sin came into the world but the Bible doesn’t say that. In the book of Ezekiel God says “the soul that sinneth it shall die”, yes? Every Christian preacher, lecturer, evangelist, quotes this and he puts a full stop in a verse which has no full stop.. where is suppose to be a comma or semi-colon the Christian puts a full stop “the soul that sinneth it shall die” then he takes you out from there to Corinthians, Philippians, Gallatians, and said everyone is a sinner, so everyone dies, unless somebody comes along and redeems him of that curse. But if you read it further.. the son shall not bear the inequity of the father, neither the father bear the inequity of the son. Father Adam he made a mistake, mother Eve made a mistake and they paid more than the full price!! If somebody goes and plucks some fruits in your garden and they were told not to, what do you do? You chase the child out you might give him a spanking, but now you follow that child out, his children and his great grandchildren for eternity! Adam and Eve sinned so God kicked them out of the garden, is that not punishing enough?? Then He curses them that you woman you will bear children in pain and suffering (labor) for what you have done.. and men you must sweat for your bread and we are all sweating and you are all laboring as a result of what Adam and Eve did. Is that not enough? He go on now and said every human being must go to Hell. We are now more than billion people in the world and everyone goes to Hell! For what? For the original sin, unless you believe in Christ. I’m asking did Eve asked you sister before eating the apple? No. Did Adam asked you before eating the apple? No. Then I said how can God hold me responsible, is he a lunatic? This god in the bible is lunatic He’s holding me responsible for what Adam and Eve did when I was not consulted? I don’t know if you were consulted by Eve then you have the right to be cursed! Thanks Normi! Less media!!!! I am trying!!! Thank you! Praise God for we can always anchor everything on Him. It is hard but we just need to keep on clinging to Him. Thanks so much for this article Joy. This article is a great reminder for me. yes, it is very true. and I experience that feeling where I compare myself to other people esp. in what I see in the social media. It is very downgrading sometimes. thanks for this article, it reminds me to align myself to Jesus who gives my true identity and the One who gives meaning and purpose in this life. God Bless you Joy and your family. May you always continue writing articles that inspires other people for God’s Glory..